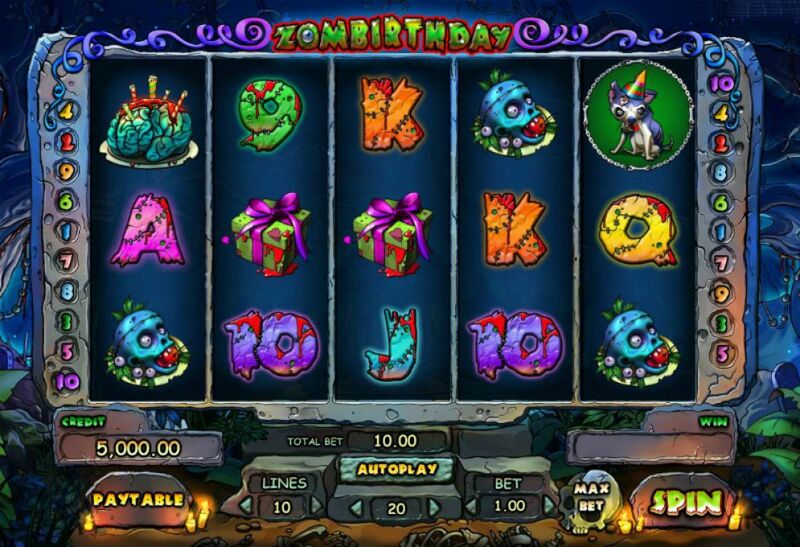 A brand new Zombie themed Easy Slots online game from Playson. Zombies were once human so it does stand to reason that they would have a birthday. We like to think that a zombie has a death day also (potential sequel perhaps). Just because zombies feed off the flesh of the living shouldn’t mean that they lose their personal birthday privileges. What do you get for a zombie on their birthday then? We’d suggest a muzzle so you can enjoy their company without the chance of them nibbling on your arm when you aren’t paying attention. 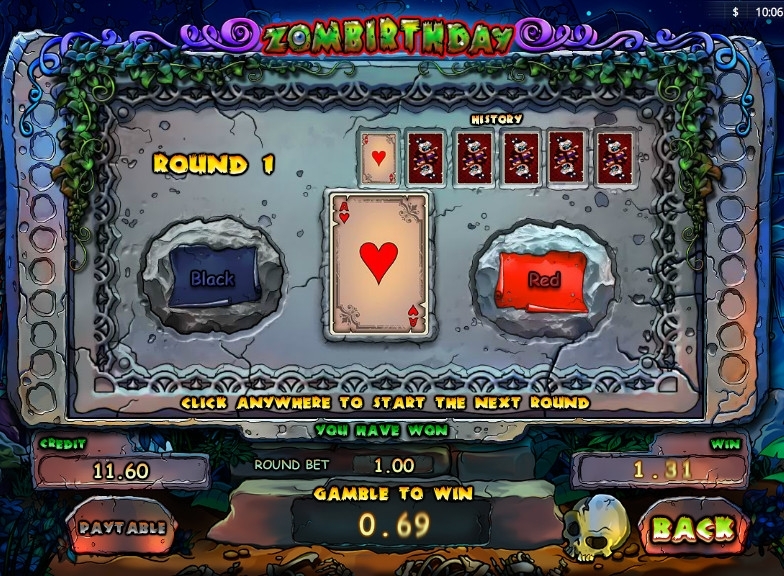 Zombirthday is a slot that is developed by Playson, this is a 5 reel by 10 pay-line slot that is packed full of exciting features to keep the party rolling. There is a max jackpot pay-out of 9,000 coins on offer here so be sure to utilise that for motivation. Who knew that zombies could throw quite a party, and guess who’s invited to their next bash? play slots today! Playson are quite new to the game developer industry but you wouldn't think so given it’s recent titles. Playson are often described as a jack of all trades company that focuses on player experiences as well as the overall design of each of their games. Without this mentality they wouldn't be where they are today, continually creating user experiences that stand head and shoulders above the rest. You can read more about the developers other games here on Easy Slots online casino site. Zombirthday is packed full of different symbols that all represent a different numerical based value. The green birthday zombie is this slots wild. The wild will replace all other symbols on the game board for the scatter symbol. Any winning combination that this slot forms it will also add a 2x multiplier to proceedings, making it even more of an incentive to match on the board. If that wasn’t incentive enough, the wild is the game’s highest-paying symbol. Finding 5 of these green oozing zombies and you’ll pocket 9,000 credits. Even if you manage to bag less symbols on the reels you will still come out with a pretty penny. Matching 4 of the wilds will grant players 2,500 and 250 for 3. There are other symbols at play here, they all are represented by things you’d associate with traditional birthdays but with an undead twist. 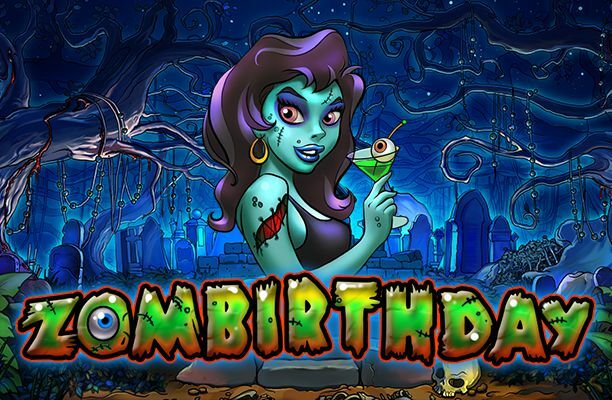 We suggest playing this slot multiple times in order to get the full Zombirthday experience. There is a lot more than meets the eye. You will see zombies in a different light after experiencing this slot, there’s no doubt about it. For more information about casino, click here! If you liked Zombirthday you might also like Twin Spin Slots game.